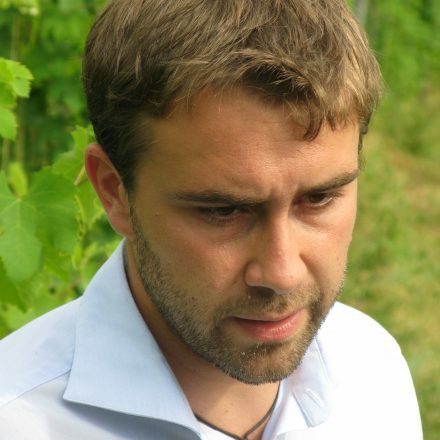 Luca Roagna represents the latest generation to work in this historical wine estate, alongside his genial father Alfredo, whose 15 hectares of vine cover both Barabresco and Barolo wine production. However the family’s roots lie in Barbaresco, with Luca’s grandfather buying the Paje vineyard in the 1950s. The key to understanding Roagna’s wine is their insistence upon biodiverse masale selected and old vineyards (up to 100 year-old in the case of Castiglione Falletto), whose plants are only green harvested up to 15 yo (older vines set their own yields naturally). Harvests tend to be more protracted than their neighbours, while cuvaisons in large conical French Garbellotto botte also outstrip the norm, lasting anything from one to two months, achieving the finest tannins and maximum extraction. The use of sulphur dioxide is minimal if applied at regular intervals. They follow organic principles. The range is dominated by three Barbaresco crus: Paje, Crichet Paje and Paje Riserva; the difference being the exposition and vine age. Not afraid to innovate, since 1982 they have also offered an ingenious non-vintage, vino di tavola blend of (Barbaresco) Nebbiolo called ‘Opera Prima’ and since ’88 a minerally white Chardonnay/Nebbiolo blend named ‘Solea’. From Barolo’s Castiglione Falletto village comes their monopole ‘Pira’ cru. Production is small. 75% Chardonnay, 25% Nebbiolo; tasted Nov’17 & Feb’18, first ever vintage released was in 1988, from the family’s single vineyard monopole Pira in Castiglione Falletto, from rows lower down & closer to the wood. Vinified in a large wooden (25HL?) tino. Candied white currant fruit notes, creamy, delicate, so refreshing & pure, the (limestone) quality of the Pira vineyard – below the cliff/Rocche of Castiglione no-less! – shining through the Charmes (Dessous!) -like Chardonnay flesh! Luminoso! Crushed velvety, rose meets fragole/strawberries aromas, a mesh, languid, salivatingly good, cleansing, lots of pretty, juicy red fruit, racy acidity, luxurious, electric! More refreshingly & pert than the warmer 2011. From their tiny 0.22ha square, just above Giacosa’s (larger plot), fermented & aged in a single 14HL wooden vat, the sandy silt component in the Asili vineyard, makes this seductive even now. Bright, precise, exhilarating violets/rose/cassis aromas, such poise; more sweet strawberry to taste, suave, dreamy, firm but fine silky tannins. Tighter, cooler, more focused than the 2011. Here the blue/grey marne is closest to the surface; the tiny 0.24ha wedge, first planted in 1929, faces ESE. The combination makes for a rose & violet petal perfume; it’s got cologne-like freshness; it’s poised as if on a knife-edge, mythical depth; Gevrey’s clay-cool presence, firm but beautifully ripe noble tannins, the penultimate vineyard to have been picked. So different from the pretty strawberry character of Asili; Asili’s soft side compared to the blue-blooded marne of Montefico! That Luca chose to serve the Paje VV after Montefico & Asili tells you something. Here’s Paje’s white stone, cassis, redcurrant leaf fruit shines through! It’s cool, wetstone sapid, backward yet transparent, the tannins unyielding at present. Immense presence, scintillating, but will need next decades of patience! Bottled on 1st August 2016, the 2007 Crichet Paje is finally starting to blossom! The active limestone character illuminates this hot dry vintage, with cool cassis menthol, sapid, tobacco, glorious red currants, fragolini, kirsch cherry, so alive & yet suave. Brilliant expression of this sunny vintage.